This month marks one whole year of operating Hand to Ground; our small-scale, regenerative, family farm business. And what a year it was for us – so many things done for the first time, research gathered, mistakes made, successes celebrated, relationships built. 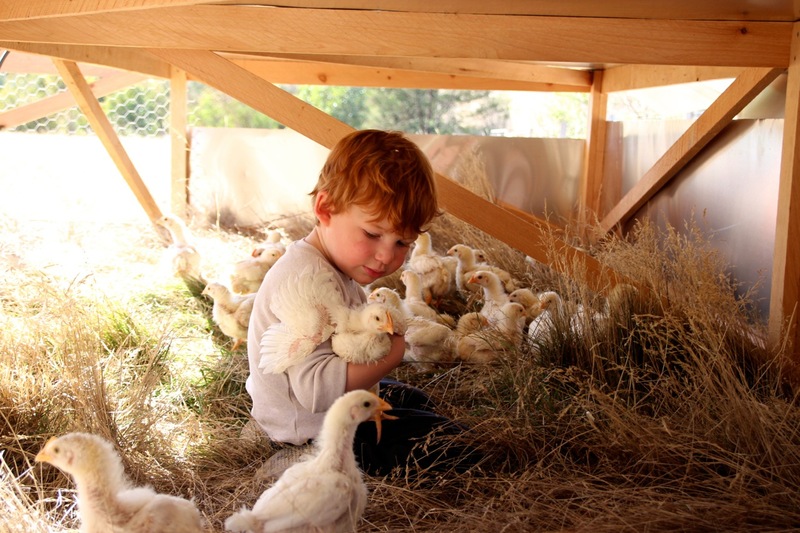 It was daunting to step out and make a go of farming full-time for a livelihood. We are told the first two to five years are the most difficult for a new business, and without the support and encouragement of friends and family, as well as mentoring through the Government’s NEIS program – we likely wouldn’t have kept going. 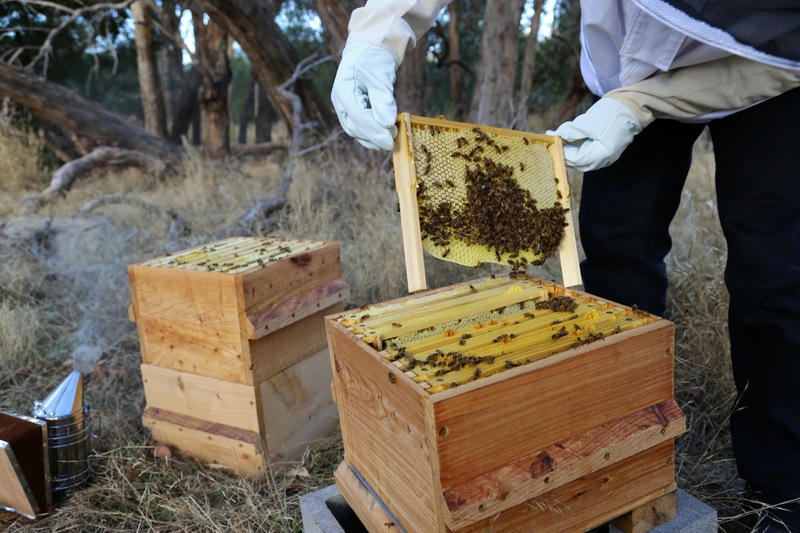 We started the year with two warré beehives in operation. 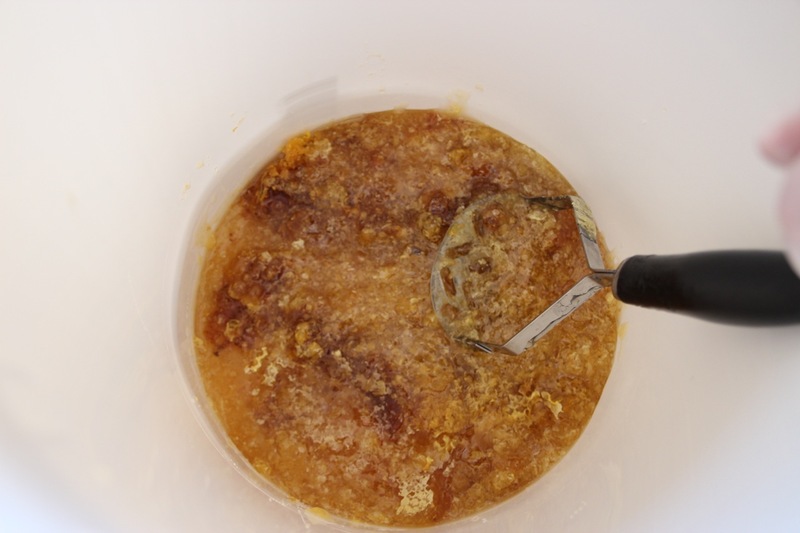 We harvested our first batch of about 9 kilos of raw cold pressed honey in March.We sold all our strained honey, and rendered the beeswax for soap and candle making and cooking. Sadly after a very dry Autumn and cold Winter we found we had lost one of our hives, the other appeared slow and weak and the colony absconded before we had to chance to re-Queen! 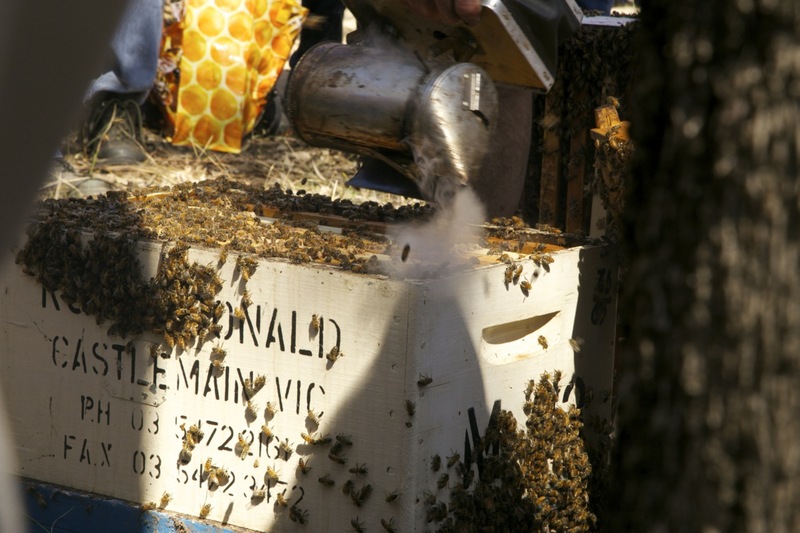 At the same time in the early Spring we gained four other colonies – two from abandoned hives on a friends’ property, and two as wild swarms – one caught onto of our water tank and one caught in a friend’s backyard. Despite a very short and hot Spring, all four hives are going well, though building their stores very slowly. 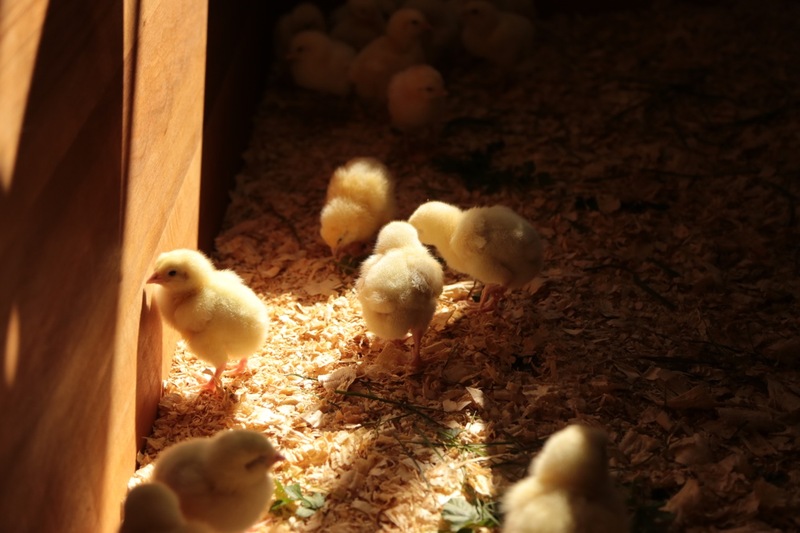 In February we welcomed 300 day-old layer chicks to our custom built wooden brooding houses. 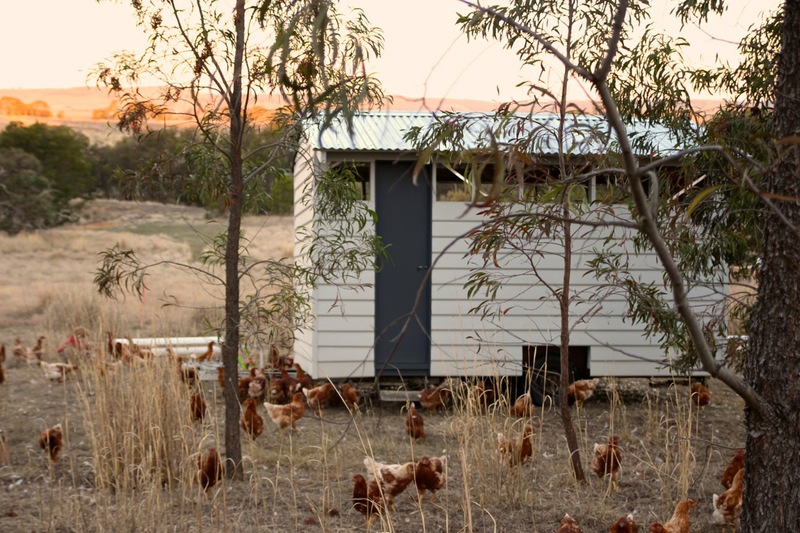 Once big enough, they moved into their beautiful “egg mobile” hen house built atop a caravan trailer – which provides shelter at night, a cool place to lay eggs in the day, and can easily be towed across the pasture. In June they began to lay eggs – about 180-210 each day – which we collect, clean and pack by hand. 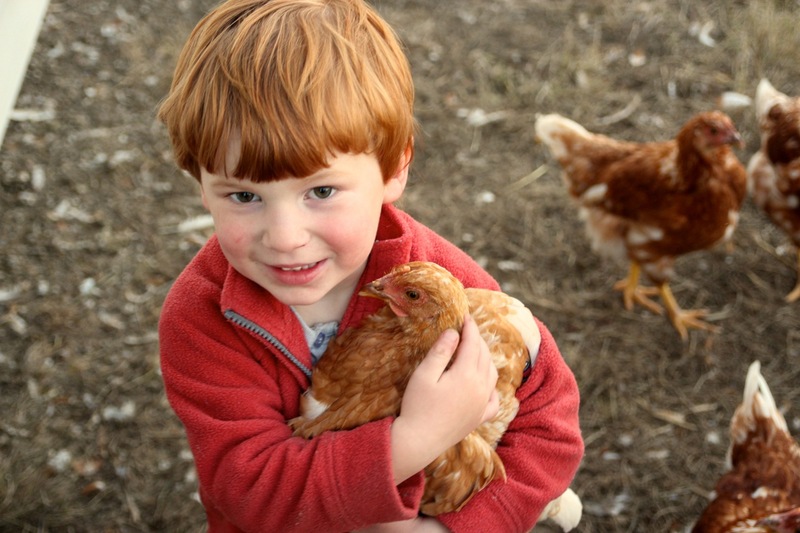 We began delivering our pastured eggs to cafes, restaurants and a green grocer in nearby towns. We added a further 50 point of lay hens in Spring, and encountered a great chicken faux pas – that you don’t ever just join two flocks of hens together without giving them some time to get used to each other (with a barrier or some kind) – otherwise the pecking order is disturbed and you experience a swift drop in egg production! We acquired two roosters to help keep the peace, and slowly got back to normal production. 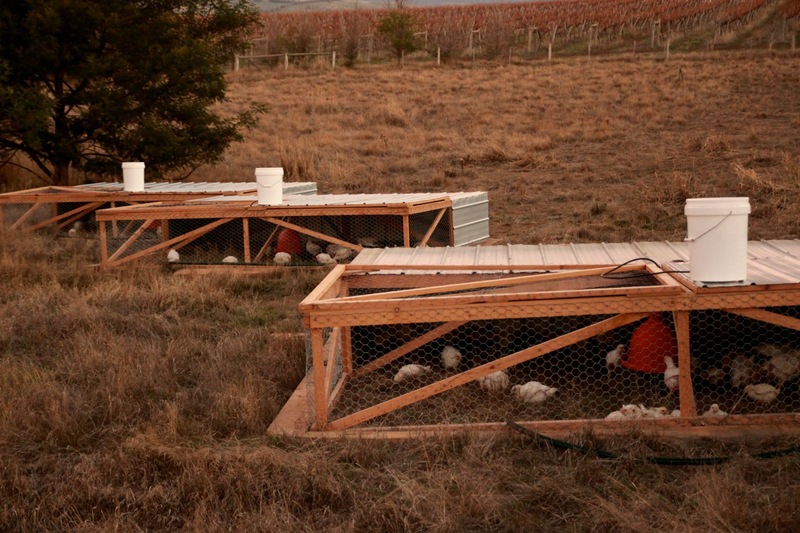 In Autumn we brooded our first batch of meat chickens. 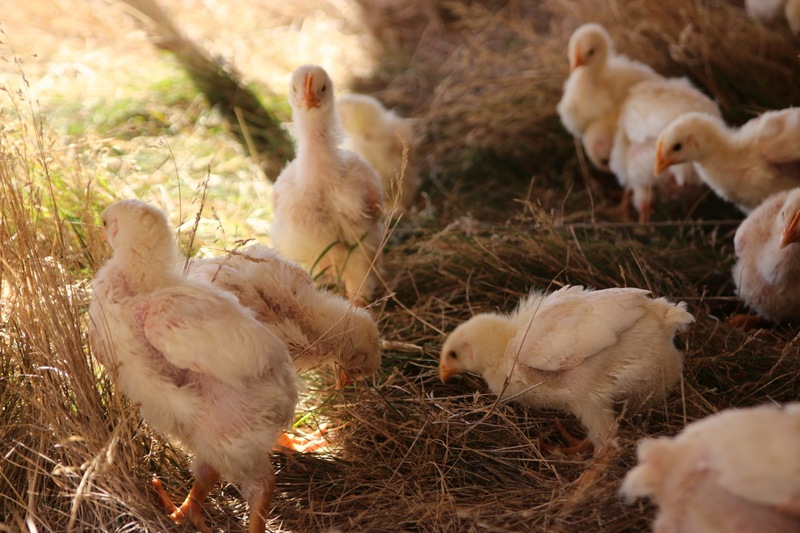 The 300 day-old broiler chicks actually arrived the afternoon of our baby boy Beren’s birth! We learnt a lot in the weeks that followed about brooding broiler chickens, our local climate and how to keep our birds healthy and thriving despite extreme temperature fluctuations and prowling foxes! 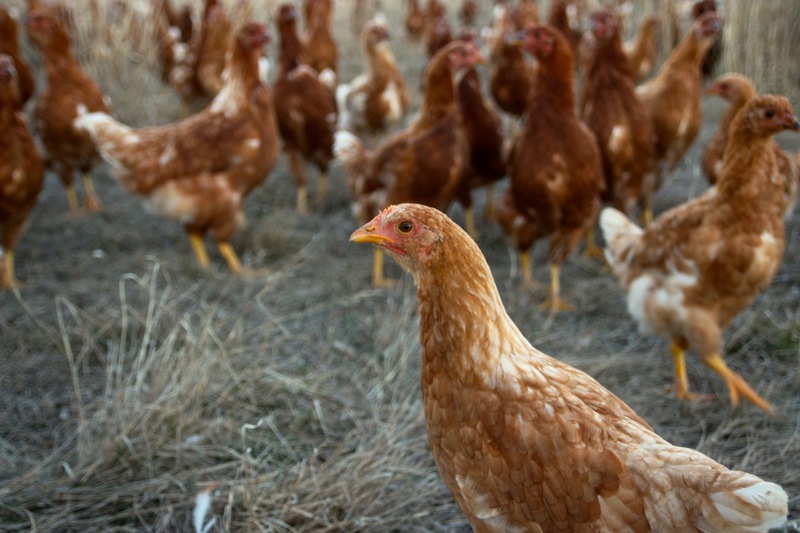 In late Winter we began brooding our next batch of meat chickens, ready for processing in late Spring and early Summer. We began suppling local cafes and restaurants with our tasty birds, as well as running a pre-order and pick-up system with our fabulous local green grocer Watts’ Fresh in Kyneton. We also bought a refrigerated trailer – and with the meat safety inspector’s tick of approval – were able to start transporting our chickens to our local farmers markets. We attended a total of 12 farmers markets with Emily’s gluten free baked goods and seasonal preserves. Her French-style baked custards “canéles” and sourdough bread were especially popular. She also ran her first gluten free bread making workshop in October – hosted by our dear friends at A Plot in Common – It was a great success and she will be holding another workshop in February. Alex was fortunate enough to see the great farmer, writer and agricultural activist – Joel Salatin speak three times this year! 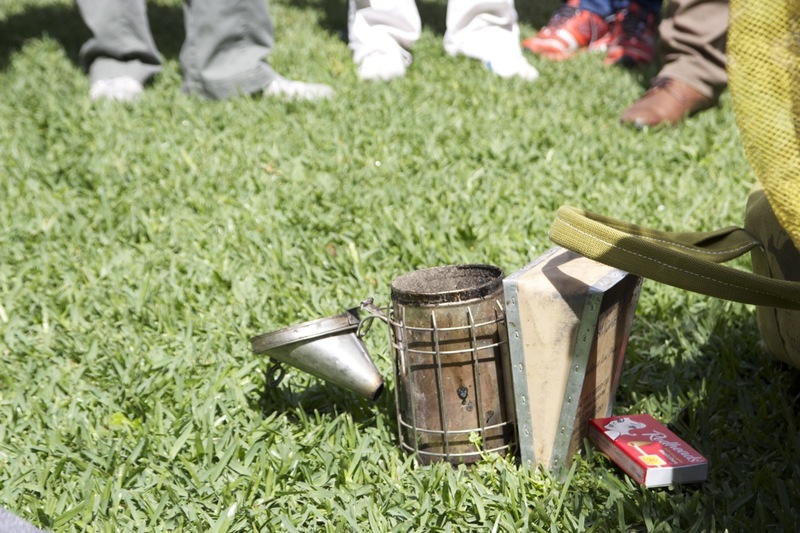 He attended a Jonai Farm’s Grow Your Ethics workshop, and was also part of a Deep Winter gathering of like-minded people to discuss the future of small scale sustainable and ethical agriculture and food sovereignty. We are optimistic that with continued public interest, political pressure and support from local communities – fair food and farming systems will continue to grow in Australia. We are so thankful for the support from our local community – our families, new friends (and old), big-hearted neighbours, chefs and restauranteurs, grocers, mums and dads – who care about what they eat and where it comes from. We do feel enormously blessed that we are still in operation – that we have access to land and water and opportunity to share what we raise with those around us. 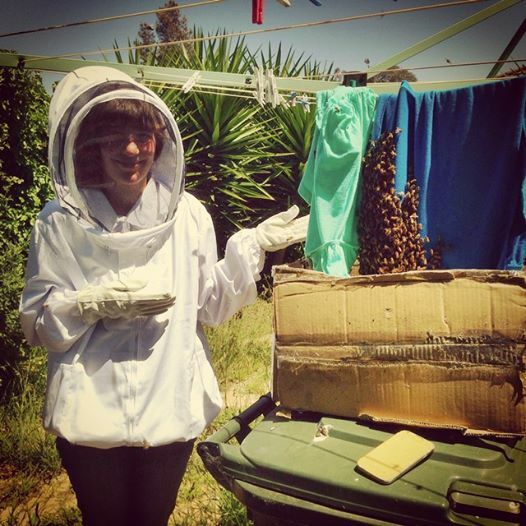 So we harvested our first honey about two months ago, I was heavily pregnant and just managed to zip up the bee suit. 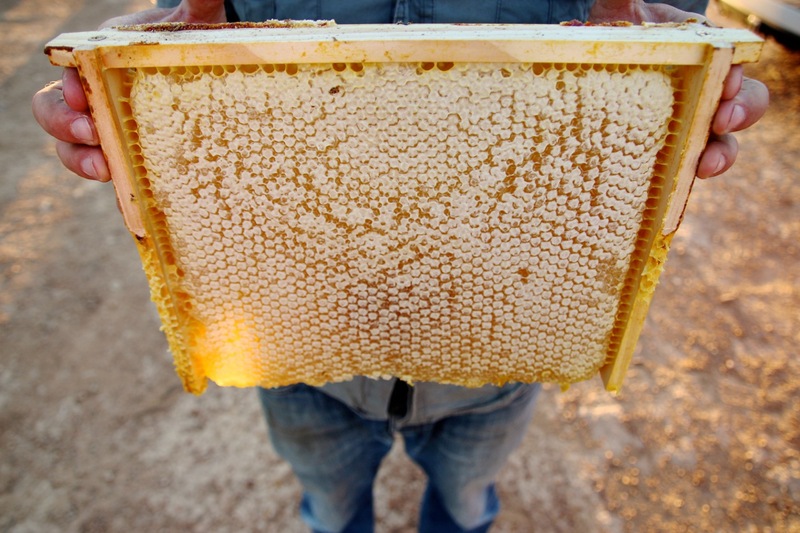 We followed David Heaf’s notes on harvesting from Warré hives – making sure we were not going to rob our bees of their most precious winter honey stores. 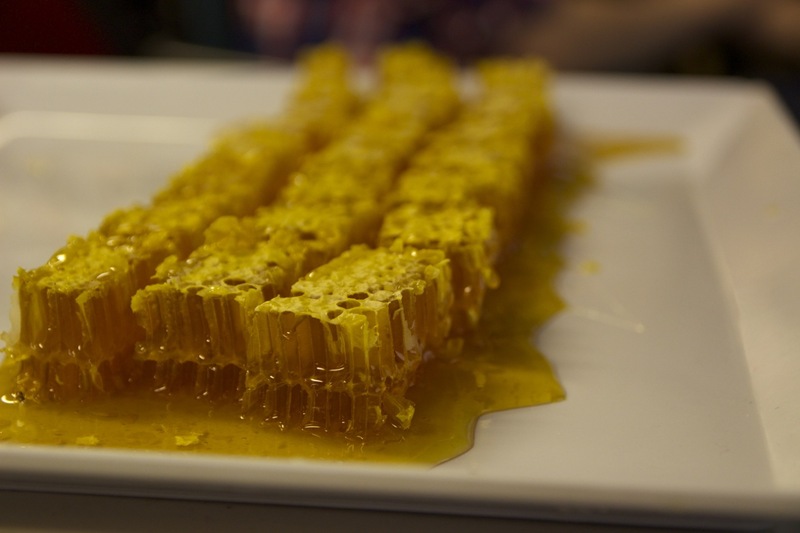 We only took frames that were almost entirely capped honey and only from our stronger hive colony (caught as a wild swarm in November last year). 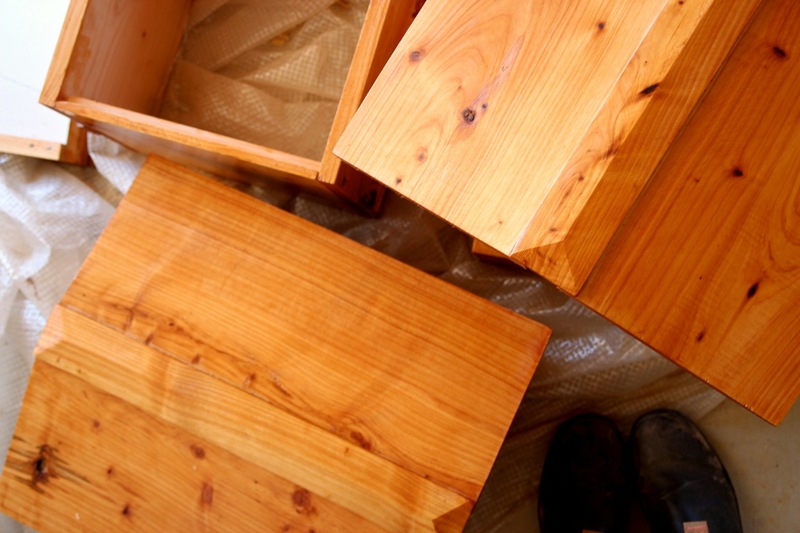 We used our smoker to extract the top-bar frames – we discovered to our frustration that some of the frames were fused to the box beneath – and had to cut them free. 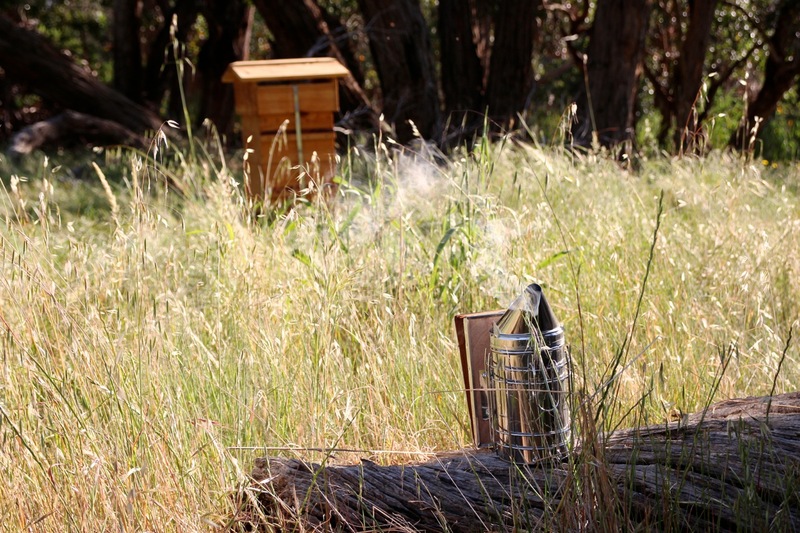 The bees were (rightly) unhappy with all the smoke and fumbling and disturbance. 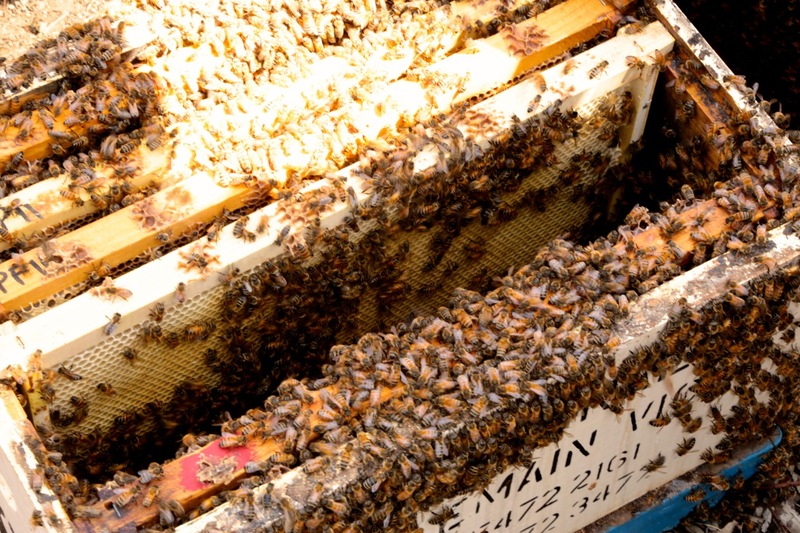 We did not really know what we were doing – let alone how to get the frames into a plastic tub and sealed without taking a lot of bees home with us, and worse without drowning or squashing them in the process! In the end we did get the frames packed for home, and oh were they beautiful… like pure gold when held up to catch the light. p.s. a few jars of our raw honey are still for sale here. Oh! So much has passed in the two months since our last blog post… we held three successful market stalls, harvested our first batch of raw cold-pressed honey (about 9 kilos worth), welcomed 300 day-old broiler chicks in to brood, moved our laying pullets out onto the pasture with their spiffy new mobile laying house, and not long afterwards moved the broiler chicks into their newly constructed pens on the grass, processed our first batch of deliciously plump pastured chicken, oh and had ourselves a beautiful baby boy – Beren Argyle – who is now six-weeks-old! It’s been a truly busy Autumn and at times hard to keep up with all that needs attending to. 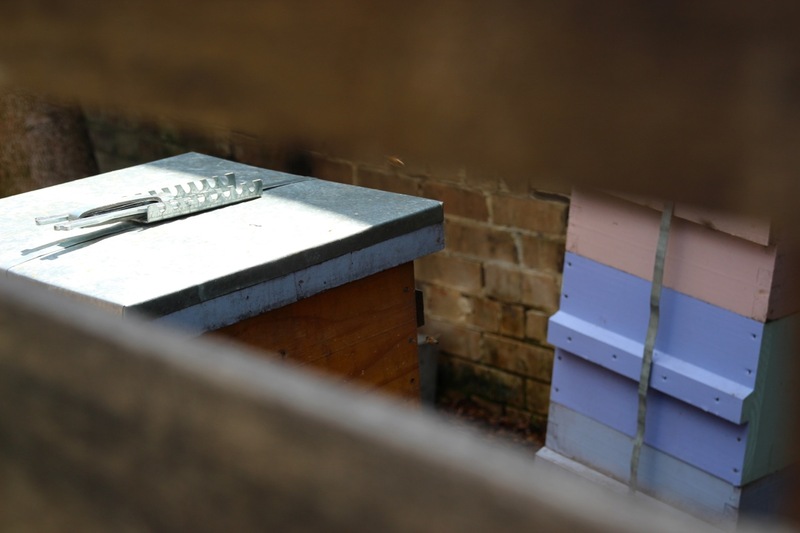 Last week we welcomed our second swarm into it’s new Warré hive and so far the bees seem smitten with their new home among the flowering yellow box trees. 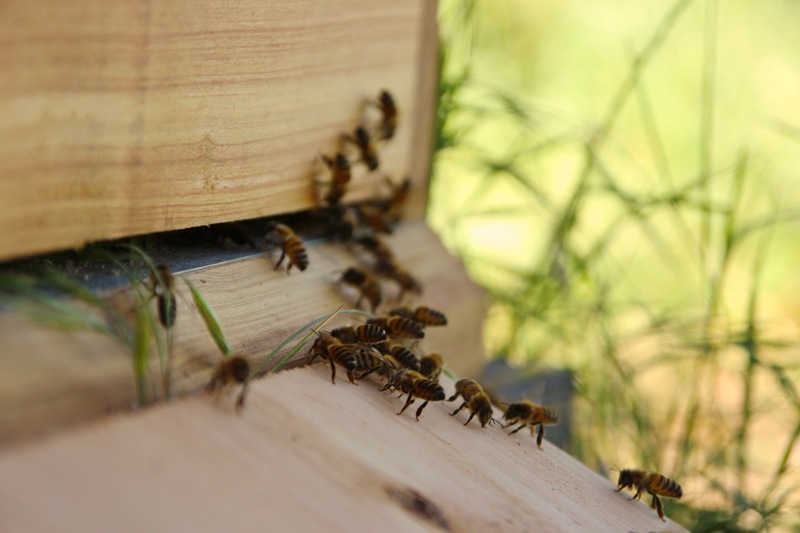 We also did our first open inspection of our older hive – mostly to nadir a third box – but also to inspect the general wellbeing of the hive and look out of for pests (of which we found no sign). 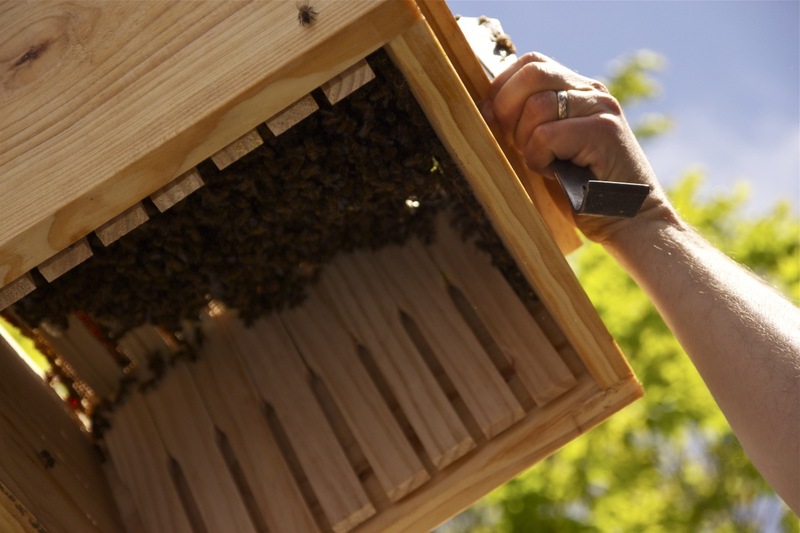 We were overjoyed to find the top box completely full of honey stores and the second almost full – so thankful we added a box when we did in case the bees should out of room and looked to swarm elsewhere! 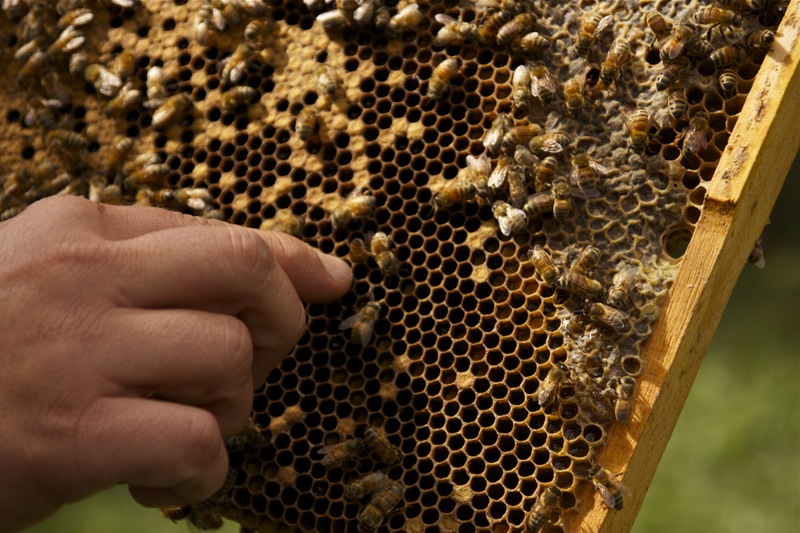 We plan to do a small harvest in Autumn, making sure there is plenty of honey stores for the bees to winter on. 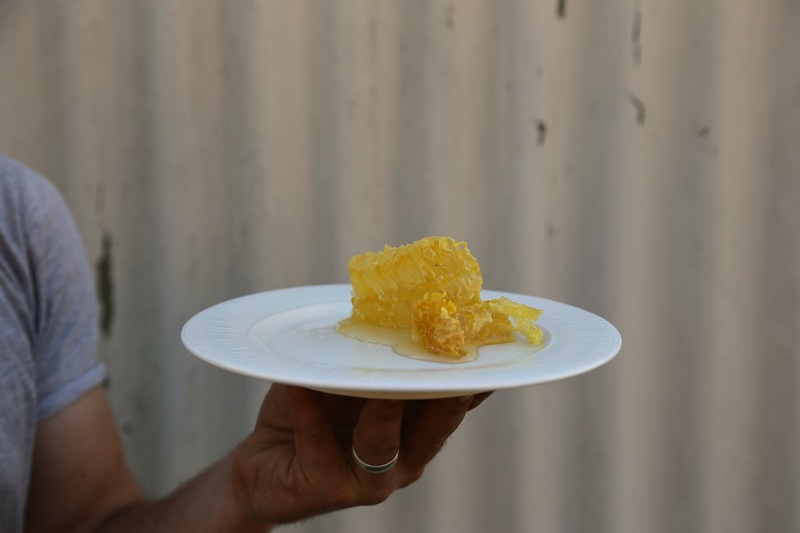 A piece of heavy honey-ladden honeycomb fell off as we were lifting the top box, I quickly bagged it and later at home we delighted in the sweetness and pale golden colour of our first raw honey. The hint of yellow-box flowers was unmistakable. What clever, glorious creatures bees are…. Can there be a more delightful sight than a swarm of bees hanging from a suburban clothes line? Perhaps only the sight of your newly-captured swarm making a happy home in a handmade hive. Alex and I agree we could watch the bees fly in and out of the hive entrance all day long, and imagine what they are doing, discussing and debating inside its walls. 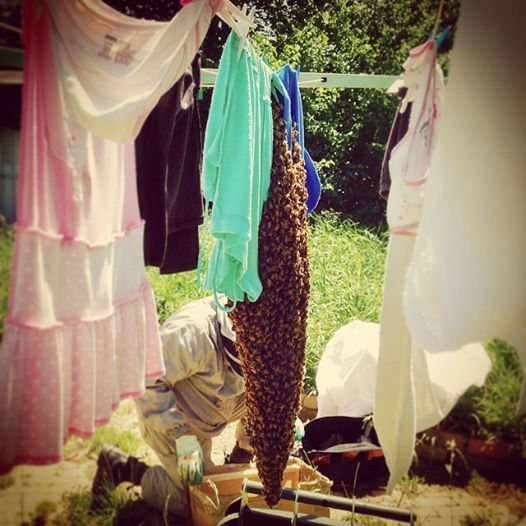 Yesterday I accompanied local beekeeping (and swarm-removing) enthusiast, Rei, in the safe recovery of a swarm that was hanging from a lady’s washing line – on her brand-new blue sweatpants no less. Rei showed me how to assemble a simple cardboard box with a frame of pure wax foundation inside to contain the swarm as it’s moved to another location. We rested the box on a garbage bin beneath the swarm and proceeded to “shake” the swarm into the box. Swarming bees are at their most docile (least likely to sting you) and quite happy to accept a new home. We left them in the box with a couple of entrances for the rest of the swarm to fly in. Then at sunset Alex and I returned to secure the box and drive back to the farm where our Warré hives are set up and ready. We used smoke to coax the last of the bees inside the box and taped all the entrances up (with plenty of breathing holes) before driving our with our boot-y of bees! It was dark when we arrived at the hives. 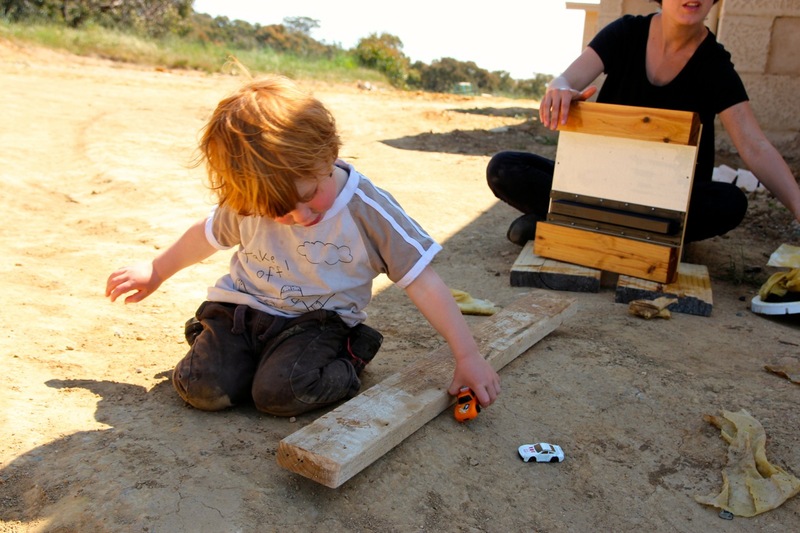 We worked in car headlights more clumsily than we would of liked – opening and tipping the cardboard bee box on the top of our hive using a spare comb box as a funnel for the bees to crawl down between the frames. In hindsight we should have prepared our smoker, and in a panic I got stung about five times on the hands because I was wearing gardening gloves instead of my leather ones and the bees were agitated at being shaken out into darkness. I haven’t been stung since I was a child and it was painful – like an intense swipe from a stinging nettle. Thankfully we got the stressed bees into the hive quickly and covered them overnight with a cotton cloth. We are so nearly finished with our first two natural bee hives – modelled on Emile Warré’s People’s Hive– a hive quite different from the conventional Langstroth and designed specifically to support the health and happiness of bees, while also being low maintenance for the keepers. 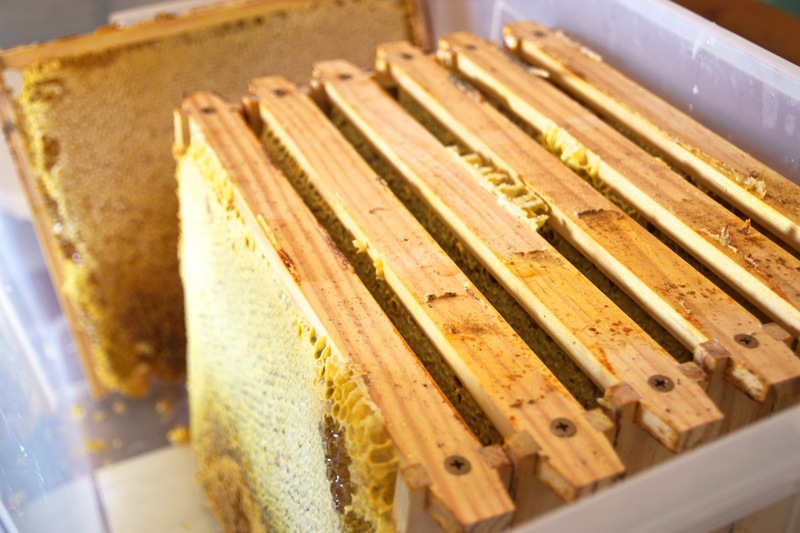 The main differences are in the deep, square hive boxes and the use of top bars instead of pre-fabricated beeswax comb set in frames – the top bars allow the bees to build their own natural comb but have sides so the bees are guided away from the sides of the box (and can be removed without much effort). 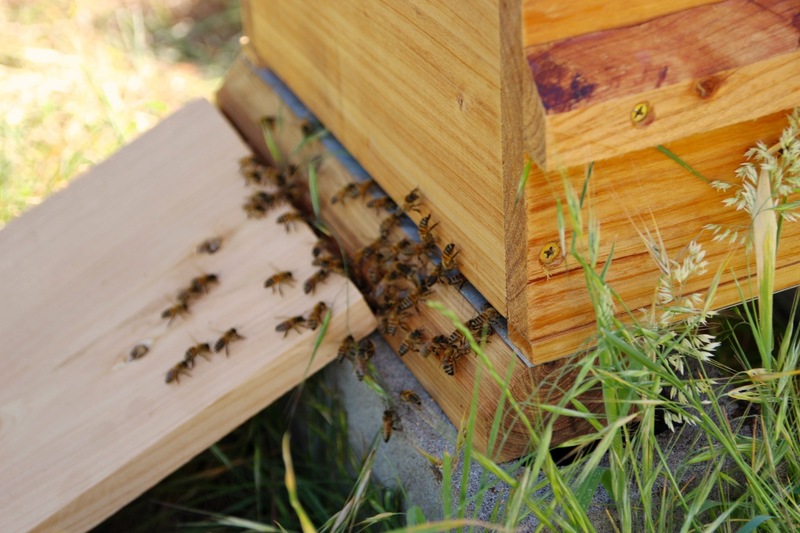 As the bees build comb downwards, additional boxes are placed below – the Queen and brood is not excluded from the rest of the hive. On the top of the hive sits a quilt box with a bag filled with wood shavings or pure wool to absorb moisture and help with the regulation of temperature (something which is exceedingly important to the bees) – then on top of that is a gabled roof to allow for increased ventilation – and in cold parts of the world act as a sloped roof to keep snow off. We used David Heaf’s “Natural Beekeping For All” for step-by-step instructions on how to construct each component. 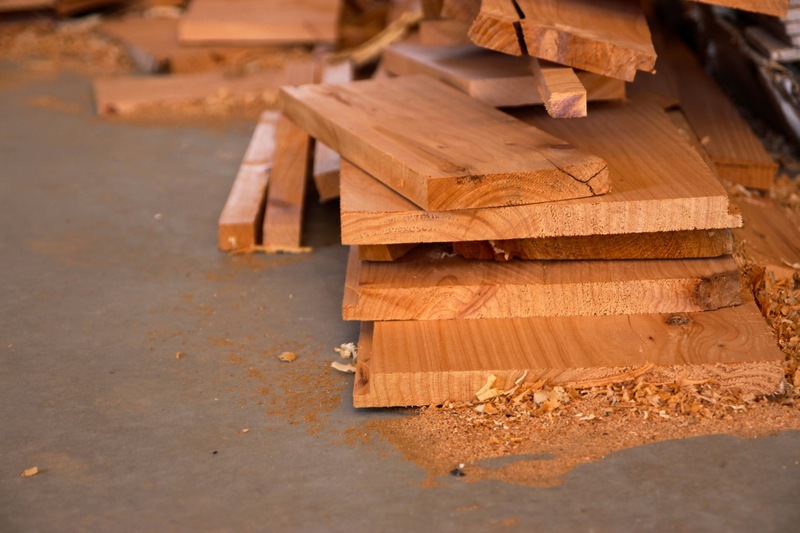 We sourced our wood from a local timberman who milled cypress logs into planks. 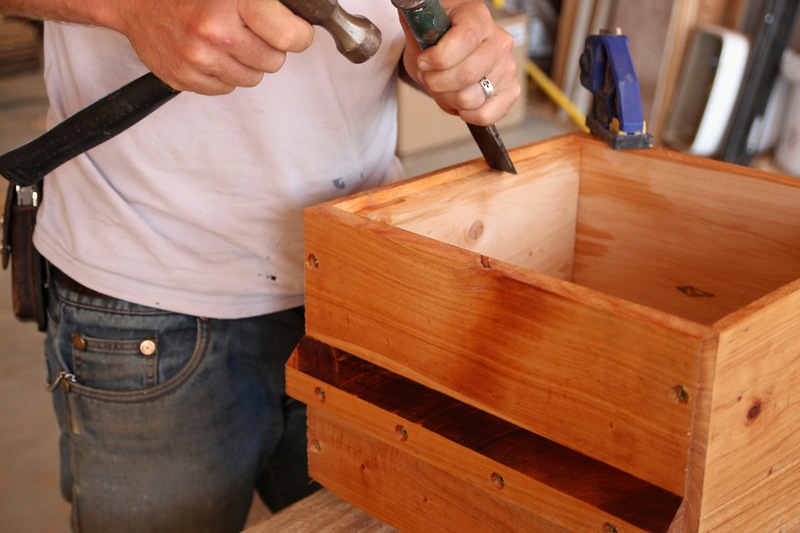 Alex then cut and assembled the boxes, quilt boxes and roofs using Tim Malfroy’s conversions for the Warré hive. We ordered top bars and two beetle repelling bottom boards. 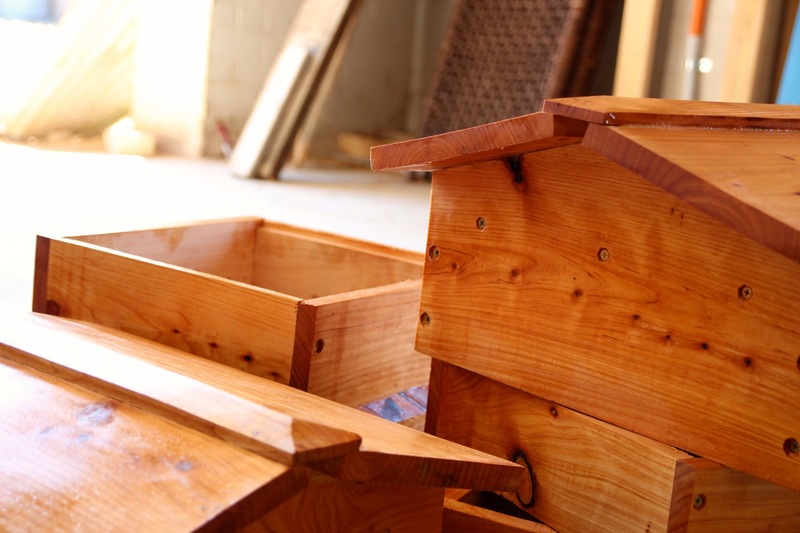 The outsides of the hives have been brushed with raw linseed oil – the inside we’d like to rub with a little pure beeswax. For the quilt box I sewed two square hessian bags which we filled with our cypress wood shavings. Now we just need to finish assembling the frames and find ourselves some honey bees! We recently joined a local club “the Woodend bee friendly society” and look forward to getting to know other enthusiasts, and assisting with some swarm catching as soon as they become available! 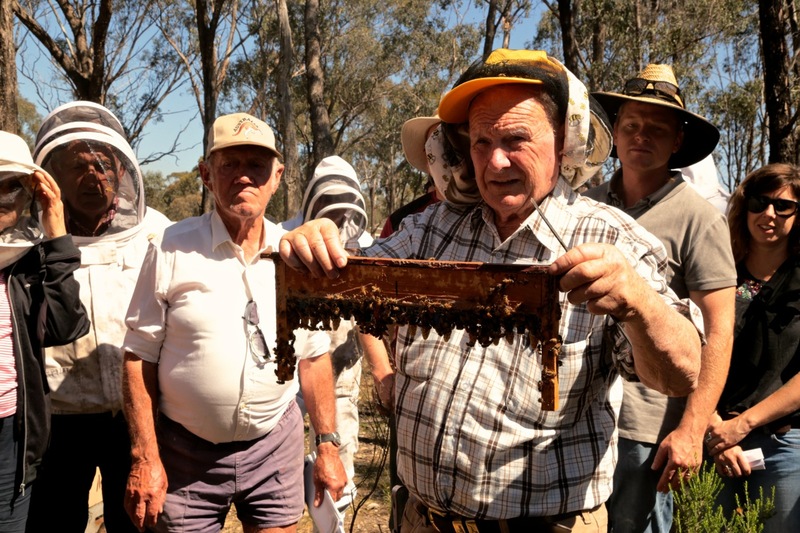 We also went to our first beekeeping field day put on by the Victorian Apiarist Association in Bendigo. We watched the opening of some hives and perused stalls of equipment and bee-related paraphernalia. 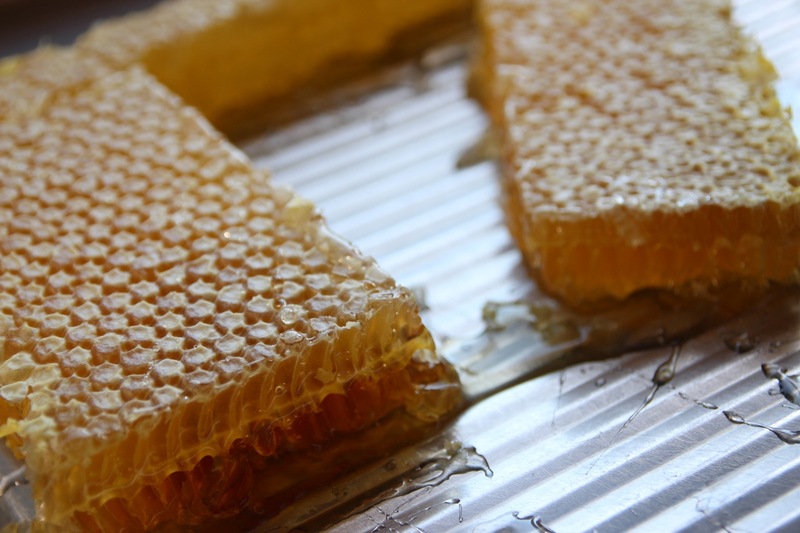 We bought a stainless steel smoker, hive tool and emlock straps – plus a couple of sheets of pure beeswax foundation and honey from a local apiarist. It was sweltering hot and I felt a bit disappointed by it all – no stalls or talks relating to natural beekeeping or even native bees – instead that overwhelming focus on increasing production, honey yield, conventional methods of breeding/keeping/extracting, fear of colony collapse… Important to know of course, but not what interests me most about bees (or why we want to keep them). I smiled, thanked him, and walked on… and thought to myself – I want our bees to trouble themselves with comb – I absolutely do. 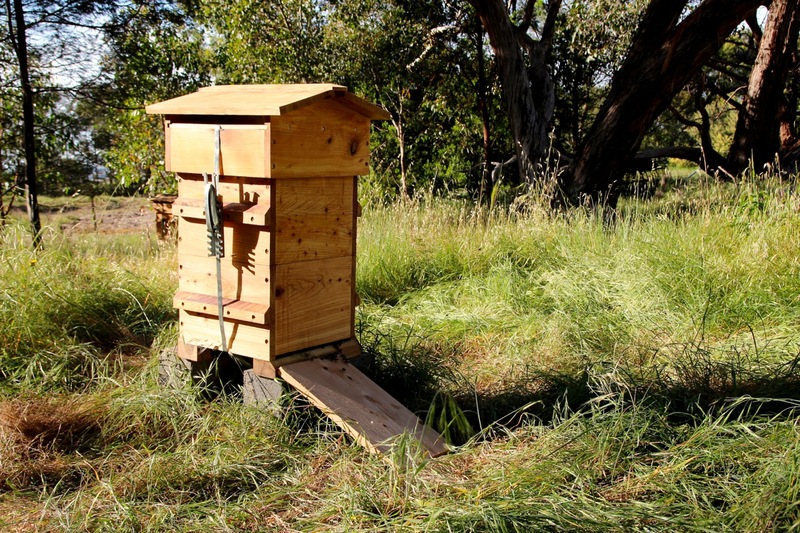 Read more about about Warré hives here. 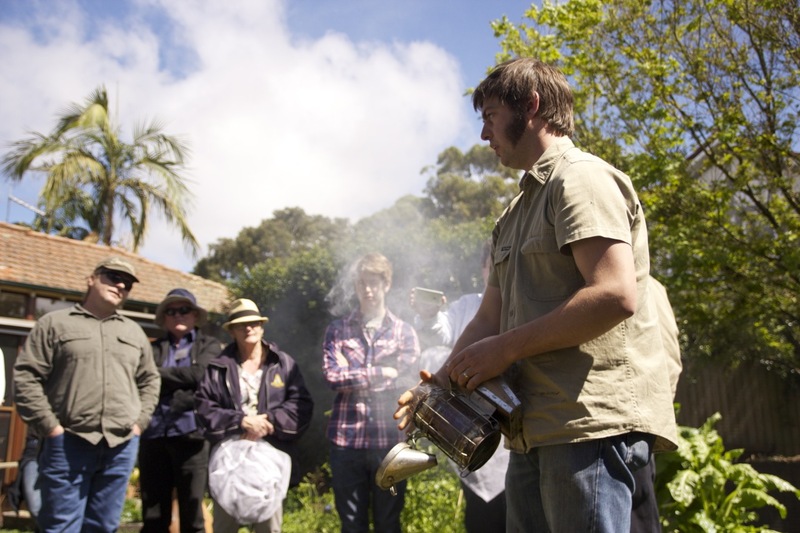 About a month ago we took Milkwood Permaculture’s two-day course in natural beekeeping with master bee-keeper (warré hive extraordinare) Tim Malfroy. It was a wonderfully inspiring and informative course. We poured over information, facts, myth, statistics, building plans about bee keeping in a world that is so indebted to these mysterious winged creatures. I came away with a desire not so much to “keep bees” as to learn alongside them. 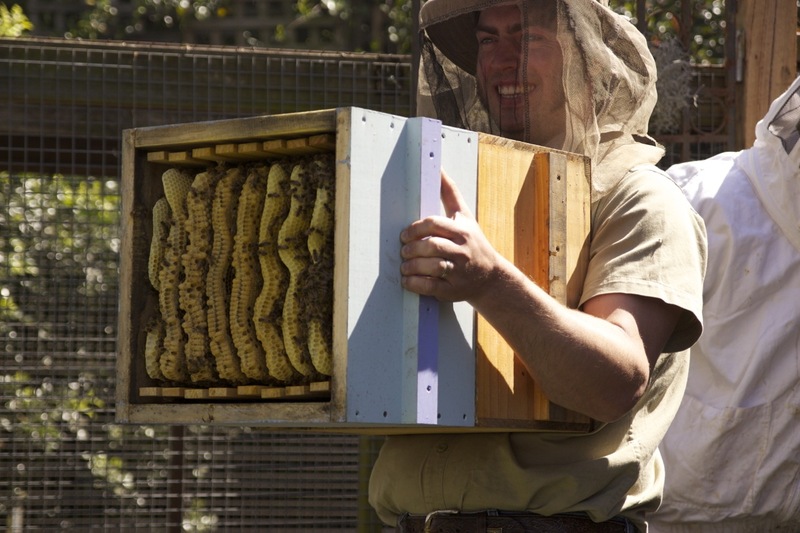 Tim took us on the second day to see a former student’s thriving apiary in inner-city Sydney. We were led around her house to her back garden – to the apiary – nothing fancy or overstated there – behind a wooden screen fence were two stacks of squarish boxes painted in pastel hues. Drawing closer I could heart a faint buzzing and see a flutter of busy wings about their entrance. 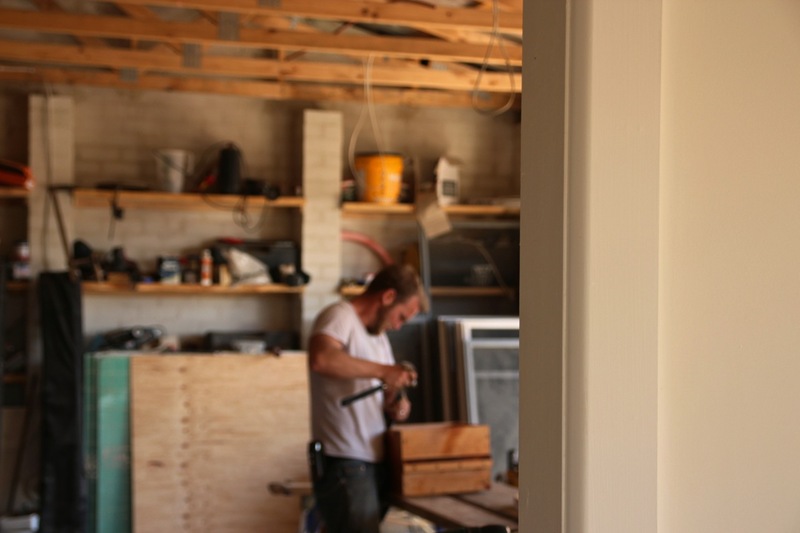 Tim walked us through the process of lighting a smoker with cypress pine needles. 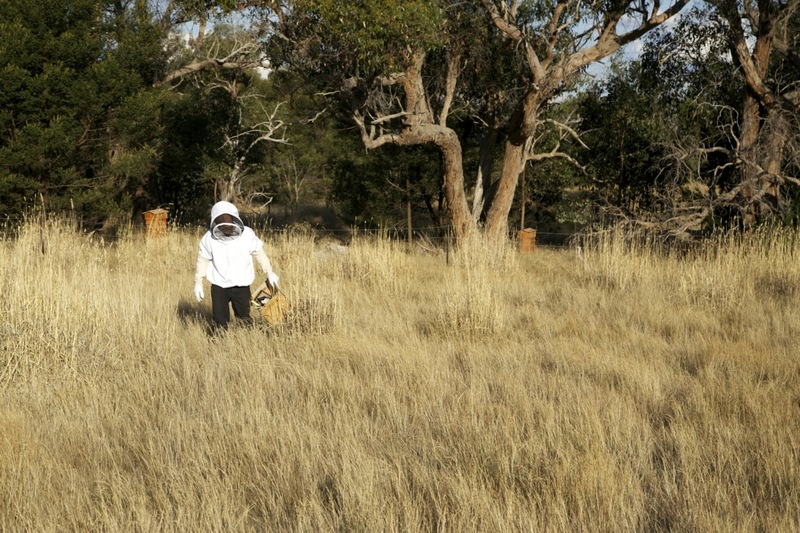 He then opened up the hives to show us the natural comb which the Warré hive system allow bees to build – he didn’t wear any gloves or fancy gear – except a veil over his face. 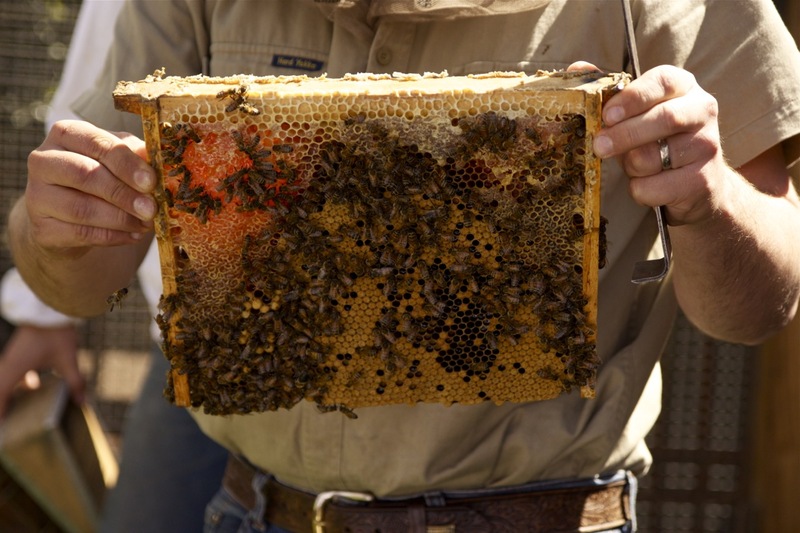 Bees don’t want to string you, Tim explained to us, they are simply trying to protect their hives; their queen, brood and internal heat necessary for their survival. I can only remember being stung by a bee maybe once or twice when I was a child. Knowing why and how and when bees sting has helped me understand their nature – and actually appreciate it more. Since taking the course I have noticed how often bees are categorised as “angry” (ie. wanting to sting you) in children’s books, cartoons, literature etc… How sad to reduce the nuances and wonderful work of bees to an emotion or a discomfort.